Product review: Helicopter Trial Flight – by Blair, 13 May 15 5/5 Excellent "My wife bought it for me on-line.Good directions were supplied. The facilities were imamculate.The staff were friendly and helpful. The equipment was as expected.The briefing was informative and concise. I felt it covered all issues of concern.I loved it! If I win the lotto I'll be sure to go back for the full course.Unfortunately the weather closed in after the flight so I didn't hang about. My wife, however, did get some footage on the video cam. " After a 'pre-flight' brief on flight controls, you will take to the air for a thrilling flight. Feel the exhilaration of effortless manoeuvrability with speeds up to 100mph whilst learning the basics of how to control a helicopter. On arrival at the Helipad, the voucher holder will be greeted by our friendly team and then introduced to one of our experienced Flight Instructors. They will be shown the flying school facility and shown around the aircraft - a perfect opportunity to take photographs. After a 15 minute pre-flight brief on the effects of the controls, take to the skies and experience the freedom of helicopter flight. 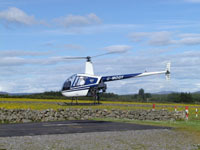 You will be asked to fly at a given height, climb, descend and turn the helicopter and on returning to the helipad will complete a hovering exercise. A word of caution - be prepared to become addicted. All flights that take place are subject to weather limitations. The following restrictions apply to all participants; a weight limit of 240lbs (17st 2lb) for the Robinson R22 and 300lbs (21st 6lb) for the Robinson R44, and in normal good health. The rotation of the helicopter rotor blades can at times produce a flickering effect, which may pose a hazard to those with epilepsy. Those suffering from an ear infection or common cold may not wish to fly as the change in pressure may damage the ears. We reserve the right to refuse service to anyone that appears to be under the influence of drugs or alcohol. Anyone having consumed drugs or alcohol will not fly. We recognise that certain flights may present difficulties for those with disabilities. Upon booking or purchasing a gift voucher we must be made aware of any disabilities that the recipient may have. Each case will be looked at individually and a mutually acceptable decision shall be made. My wife bought it for me on-line.Good directions were supplied. The facilities were imamculate.The staff were friendly and helpful. The equipment was as expected.The briefing was informative and concise. I felt it covered all issues of concern.I loved it! If I win the lotto I'll be sure to go back for the full course.Unfortunately the weather closed in after the flight so I didn't hang about. My wife, however, did get some footage on the video cam.